360 Alert Security LTD, is a well established leading Private Security Company based in Manchester. We provide a comprehensive wide range of security services throughout the nation. Failure to choose the right security partner can result in your asset, property, even lives placed at risk. therefore if you feel that your current security arrangements need improvements. We are committed to providing the highest quality of security and protection services to individuals and businesses. We offer a complete professional cost-effective and high standard of security service in Nottingham and throughout Nationwide. GUARANTEED TO BEAT ANY QUOTE. We are committed to ensuring safe, secure and efficient security service in place tailored to your business above and beyond your needs. Our security officers are highly trained and motivated, as our supervisors are on the job seven days a week around the clock to ensure the highest quality service delivered. 360 Alert Security Limited is committed to it's mission of providing a professional, responsive, caring security service and always keeping public safety in mind. We are committed to providing the highest quality of security and protection services to individuals and businesses. Our mission is to provide our clientele with superior service that is consistent with their ever changing security requirements. Our clients invest in our security services to protect their assets, business activities and other resources. Our web-based software accessible from any desktop computer, laptop, tablet or smartphone, ideal for posted officers, every task is simplified and optimised for them. 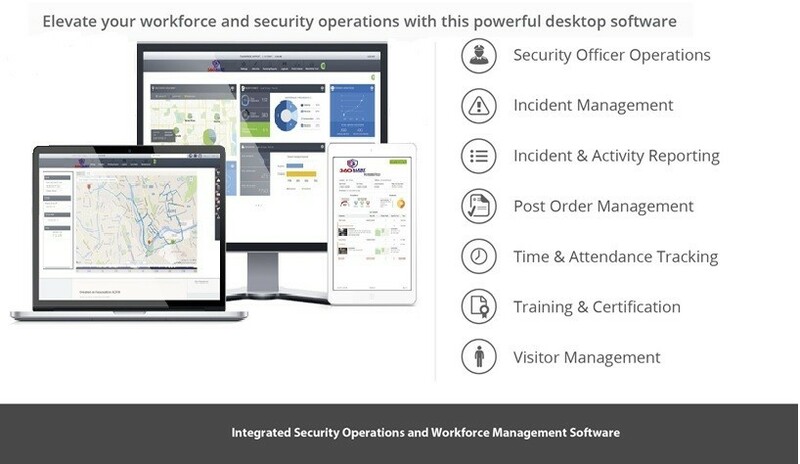 Like any 360 Alert Security solutions, it comes a full workforce management software with real-time tracking, automated reports, a live dashboard and much more, supervisors can easily manage multiple sites remotely with this 360 Alert Security powerful desktop software. 360 Alert Security is a step ahead in technology amongst its competitors, 360 Alert Security mobile app is the ultimate tool to place in the hands of our security officers or mobile workforce. The app allows our team to increase efficiency and gather key information from the field like never before. Supervisors can easily manage multiple sites remotely with 360 Alert Security powerful mobile app.